Provide comfort for the family of William Walton with a meaningful gesture of sympathy. Walton, William. Beloved husband of the late Irma (nee Barnickle) Walton and Corrine (Vettel) Walton. Loving father of Patricia (Daniel) Hornbach, Margaret (Brian) Lawrence, Kathy (Mike) Otting, and Steven (Cheryl) Walton. Cherished grandpa of Sarah (Scott) SIpe, Kelsey (Matt) Dicker, Michelle Asbrock, Jaime (Carla) Asbrock, Alicia (Ralph) Rose, Mike (Jess) Otting, Lindsay (Frank) Couch, and Rebecca Walton. Great grandpa of 17. Dear brother of the late Joe Davis, Jeanne Gassert, Bernard Walton, and Mick Jaquish. Also survived by many loving nieces and nephews. Passed away March 4th at the age of 89. Family will receive friends Saturday, March 9th from 11AM until time of funeral blessing and military honors at Noon at Neidhard-Minges Funeral Home, 3155 Harrison Ave Cincinnati, Ohio 45211 (Westwood). Memorials may be made to American Cancer Society. 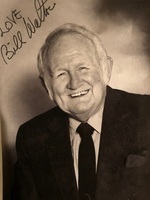 With Loving Memory of my "Uncle Bill". May your beer always be cold, and your "Reds always be rounding third and heading for home". Dale purchased flowers for the family of William Walton.